The lipstick is always on women’s shopping list. Women used to discuss the bag but now they would more like to talk about the lipsticks. Why do women have special preference to the lipsticks? It is hard to tell the story. But one of the most important reasons why women love lipsticks is that it can add their beauty and charm. On one hand, women love different kinds of lipsticks. On the other hand, they are afraid of the unidentified additive or cancerogenic substance on the lipstick. Therefore, the lipstick DIY become more and more popular. Typically, women may struggle between the aluminum moulds and silicone one. What kinds of moulds are better? Now we make it clear that what the advantages and disadvantages of aluminum and silicone moulds are. 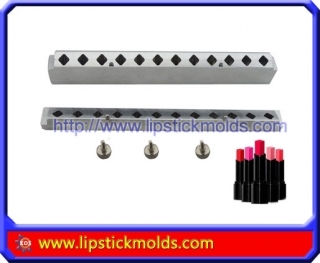 The aluminum lipstick mould, just as its name shows, is made of aluminum. The aluminum moulds allow people to release the lipstick conveniently in that the lipstick moulds has a smooth wall. The aluminum lipstick mold with high quality must be polished well. Thus, the smooth and polishing moulds enables to strip the lipstick easily without any special skills. It can reduce the risk of broken lipstick. Moreover, the aluminum molds are not expensive. Some people would like to choose the silicone one for its cheaper price. That’s not the truth. 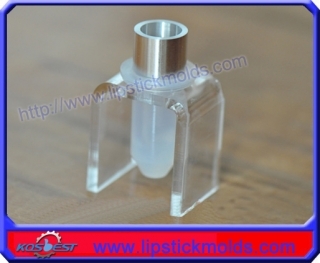 Compared with the silicone lipstick molds from the normalization production, the aluminum one is cost-effective. Not only are the aluminum mold durable, but also it has quality guarantee. If there is something bad to the aluminum molds, they could be sent to depot repair. Last but not least, the aluminum moulds are easy to be customized. A coin has two sides. So did the aluminum molds. The aluminum lipstick shape is limited in that it is hard to create a complicated style with the aluminum material. What’s worse, the lipstick will have a parting because the aluminum lipstick molds are divided into two parts (top and bottom). The parting line has bad influence in the beautiful lipstick. The silicone lipstick molds, which are made of silicone material, have beautiful shapes without parting line. They are preferred and selected by the users in that it can customize the logo and complicated styles. If you want to make complicate lipsticks shapes such as flowers, it would be better for the users to choose the silicone one. However, the users need to pay more attention when stripping the lipstick from the mould. And it is a little bit more difficult for the user to clean up the molds. It is quite suitable for DIY user.